Khan had been dating actress Kareena Kapoor since October 2007. In October 2009 he publicly spoke of his relationship with Kapoor and the prospect of marriage stating, that in his opinion people said that marriage does not affect one's career but in fact it does and that today the whole definition of marriage has changed. He said, that he and Kareena were so well connected, so close that marriage is just a stamp of validation for the society. 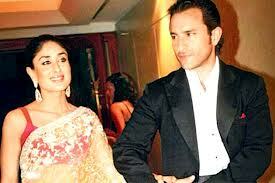 Saif and Kareena got married in court on 16 October 2012.